As you age, the way your senses (hearing, vision, taste, smell, touch) give you information about the world changes. Your senses become less sharp, and this can make it harder for you to notice details. Sensory changes can affect your lifestyle. You may have problems communicating, enjoying activities, and staying involved with people. Sensory changes can lead to isolation. Your senses receive information from your environment. This information can be in the form of sound, light, smells, tastes, and touch. Sensory information is converted into nerve signals that are carried to the brain. There, the signals are turned into meaningful sensations. A certain amount of stimulation is required before you become aware of a sensation. This minimum level of sensation is called the threshold. Aging raises this threshold. You need more stimulation to be aware of the sensation. Aging can affect all of the senses, but usually hearing and vision are most affected. Devices such as glasses and hearing aids, or lifestyle changes can improve your ability to hear and see. Your ears have two jobs. One is hearing and the other is maintaining balance. Hearing occurs after sound vibrations cross the eardrum to the inner ear. The vibrations are changed into nerve signals in the inner ear and are carried to the brain by the auditory nerve. Balance (equilibrium) is controlled in the inner ear. Fluid and small hair in the inner ear stimulate the auditory nerve. This helps the brain maintain balance. 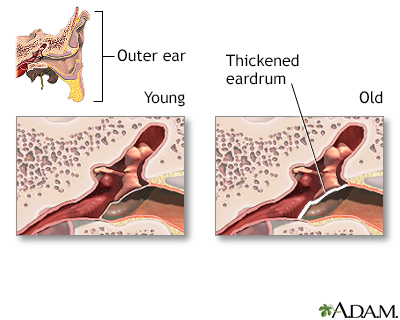 As you age, structures inside the ear start to change and their functions decline. Your ability to pick up sounds decreases. You may also have problems maintaining your balance as you sit, stand, and walk. Age-related hearing loss is called presbycusis. It affects both ears. Hearing, often the ability to hear high-frequency sounds, may decline. You may also have trouble telling the difference between certain sounds. Or, you may have problems hearing a conversation when there is background noise. If you are having trouble hearing, discuss your symptoms with your health care provider. One way to manage hearing loss is by getting fitted with hearing aids. Age-related hearing loss, or presbycusis, is the slow loss of hearing that occurs as people get older. Persistent, abnormal ear noise (tinnitus) is another common problem in older adults. Causes of tinnitus may include wax buildup or medicines that damage structures inside the ear. If you have tinnitus, ask your provider how to manage the condition. Impacted ear wax can also cause trouble hearing and is common with age. Your provider can remove impacted ear wax. Vision occurs when light is processed by your eye and interpreted by your brain. Light passes through the transparent eye surface (cornea). It continues through the pupil, the opening to the inside of the eye. The pupil becomes larger or smaller to control the amount of light that enters the eye. The colored part of the eye is called the iris. It is a muscle that controls pupil size. After light passes through your pupil, it reaches the lens. The lens focuses light on your retina (the back of the eye). The retina converts light energy into a nerve signal that the optic nerve carries to the brain, where it is interpreted. All of the eye structures change with aging. The cornea becomes less sensitive, so you might not notice eye injuries. By the time you turn 60, your pupils may decrease to about one third of the size they were when you were 20. The pupils may react more slowly in response to darkness or bright light. The lens becomes yellowed, less flexible, and slightly cloudy. The fat pads supporting the eyes decrease and the eyes sink into their sockets. The eye muscles become less able to fully rotate the eye. As you age, the sharpness of your vision (visual acuity) gradually declines. The most common problem is difficulty focusing the eyes on close-up objects. This condition is called presbyopia. Reading glasses, bifocal glasses, or contact lenses can help correct presbyopia. Presbyopia is a condition in which the lens of the eye loses its ability to focus. This makes it hard to see objects up close. You may be less able to tolerate glare. For example, glare from a shiny floor in a sunlit room can make it difficult to get around indoors. You may have trouble adapting to darkness or bright light. Problems with glare, brightness, and darkness may make you give up driving at night. As you age, it gets harder to tell blues from greens than it is to tell reds from yellows. Using warm contrasting colors (yellow, orange, and red) in your home can improve your ability to see. Keeping a red light on in darkened rooms, such as the hallway or bathroom, makes it easier to see than using a regular night light. 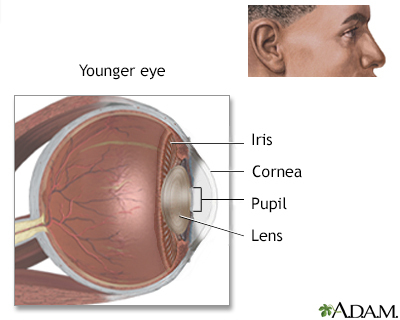 With aging, the gel-like substance (vitreous) inside your eye starts to shrink. This can create small particles called floaters in your field of vision. In most cases, floaters do not reduce your vision. But if you develop floaters suddenly or have a rapid increase in the number of floaters, you should have your eyes checked by a professional. Reduced peripheral vision (side vision) is common in older people. This can limit your activity and ability to interact with others. It may be hard to communicate with people sitting next to you because you cannot see them well. Driving can become dangerous. Weakened eye muscles may prevent you from moving your eyes in all directions. It may be hard to look upward. The area in which objects can be seen (visual field) gets smaller. Aging eyes also may not produce enough tears. This leads to dry eyes. When dry eyes are not treated, infection, inflammation, and scarring of the cornea can occur. You can relieve dry eyes by using eye drops or artificial tears. A cataract is a clouding of the lens of the eye. If you are having vision problems, discuss your symptoms with your provider. The senses of taste and smell work together. Most tastes are linked with odors. The sense of smell begins at the nerve endings high in the lining of the nose. You have about 10,000 taste buds. Your taste buds sense sweet, salty, sour, bitter, and umami flavors. Umami is a taste linked with foods that contain glutamate, such as the seasoning monosodium glutamate (MSG). Smell and taste play a role in food enjoyment and safety. A delicious meal or pleasant aroma can improve social interaction and enjoyment of life. Smell and taste also allow you to detect danger, such as spoiled food, gases, and smoke. The number of taste buds decreases as you age. Each remaining taste bud also begins to shrink. Sensitivity to the five tastes often declines after age 60. In addition, your mouth produces less saliva as you age. This can cause dry mouth, which can affect your sense of taste. Your sense of smell can also diminish, especially after age 70. This may be related to a loss of nerve endings and less mucus production in the nose. Mucus helps odors stay in the nose long enough to be detected by the nerve endings. It also helps clear odors from the nerve endings. Certain things can speed up the loss of taste and smell. These include diseases, smoking, and exposure to harmful particles in the air. Decreased taste and smell can lessen your interest and enjoyment in eating. You may not be able to sense certain dangers if you cannot smell odors such as natural gas or smoke from a fire. Switch to a different medicine, if the medicine you take is affecting your ability to smell and taste. Use different spices or change the way you prepare food. Buy safety products, such as a gas detector that sounds an alarm you can hear. The sense of touch makes you aware of pain, temperature, pressure, vibration, and body position. Skin, muscles, tendons, joints, and internal organs have nerve endings (receptors) that detect these sensations. Some receptors give the brain information about the position and condition of internal organs. Though you may not be aware of this information, it helps to identify changes (for example, the pain of appendicitis). Appendicitis is inflammation of the appendix. The appendix is a small pouch attached to the large intestine. Your brain interprets the type and amount of touch sensation. It also interprets the sensation as pleasant (such as being comfortably warm), unpleasant (such as being very hot), or neutral (such as being aware that you are touching something). With aging, sensations may be reduced or changed. These changes can occur because of decreased blood flow to the nerve endings or to the spinal cord or brain. The spinal cord transmits nerve signals and the brain interprets these signals. Health problems, such as a lack of certain nutrients, can also cause sensation changes. Brain surgery, problems in the brain, confusion, and nerve damage from injury or long-term (chronic) diseases such as diabetes can also result in sensation changes. Symptoms of changed sensation vary based on the cause. With decreased temperature sensitivity, it can be hard to tell the difference between cool and cold and hot and warm. This can increase the risk of injury from frostbite, hypothermia (dangerously low body temperature), and burns. Frostbite is damage to the skin and underlying tissues caused by extreme cold. Frostbite is the most common freezing injury. Hypothermia is dangerously low body temperature, below 95°F (35°C). Reduced ability to detect vibration, touch, and pressure increases the risk of injuries, including pressure ulcers (skin sores that develop when pressure cuts off blood supply to the area). After age 50, many people have reduced sensitivity to pain. Or you may feel and recognize pain, but it does not bother you. For example, when you are injured, you may not know how severe the injury is because the pain does not trouble you. A pressure sore is an area of the skin that breaks down when something keeps rubbing or pressing against the skin. You may develop problems walking because of reduced ability to perceive where your body is in relation to the floor. This increases your risk of falling, a common problem for older people. Older people can become more sensitive to light touches because their skin is thinner. If you have noticed changes in touch, pain, or problems standing or walking, talk with your provider. There may be ways to manage the symptoms. Lower the water heater temperature to no higher than 120°F (49°C) to avoid burns. Check the thermometer to decide how to dress, rather than waiting until you feel overheated or chilled. Inspect your skin, especially your feet, for injuries. If you find an injury, treat it. DO NOT assume the injury is not serious because the area is not painful. Aging changes in the skin are a group of common conditions and developments that occur as people grow older. Emmett SD, Seshamani M. Otolaryngology in the elderly. In: Flint PW, Haughey BH, Lund V, et al, eds. Cummings Otolaryngology: Head & Neck Surgery. 6th ed. Philadelphia, PA: Elsevier Saunders; 2015:chap 16. Harlow EN, Lyons WL. Assessment. In: Ham RJ, Sloane PD, Warshaw GA, Potter JF, Flaherty E, eds. Ham's Primary Care Geriatrics. 6th ed. Philadelphia, PA: Elsevier Saunders; 2014:chap 3. Studenski S, Van Swearingen J. Falls. In: Fillit HM, Rockword K, Young J, eds. Brocklehurst's Textbook of Geriatric Medicine and Gerontology. 8th ed. Philadelphia, PA: Elsevier; 2017:chap 103. Walston JD. Common clinical sequelae of aging. In: Goldman L, Schafer AI, eds. Goldman-Cecil Medicine. 25th ed. Philadelphia, PA: Elsevier Saunders; 2016:chap 25. With aging, ear structures deteriorate. The eardrum often thickens and the inner ear bones and other structures are affected. Some hearing loss is almost inevitable with age. It is estimated that 30% of all people over 65 have significant hearing impairment. Conductive hearing loss occurs when sound has problems getting through the external and middle ear. 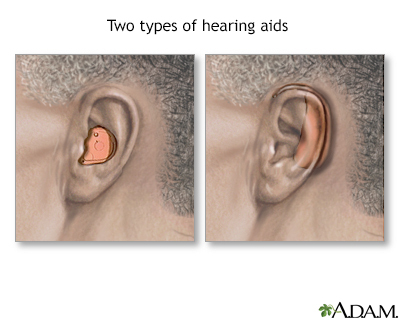 Surgery or a hearing aid may be helpful for this type of hearing loss. The tongue is mainly composed of muscles. It is covered with a mucous membrane. Small nodules of tissue, called papillae, cover the upper surface of the tongue. Between the papillae are the taste buds, which provide the sense of taste. 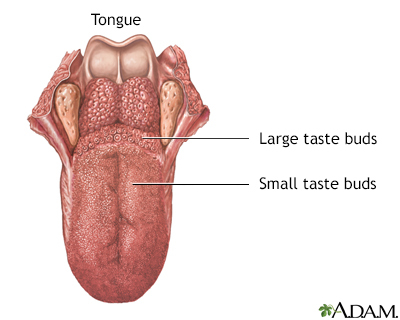 In addition to taste, the tongue functions in moving food to aid chewing and swallowing, and it is important in speech. Vision occurs when light is processed by the eye and interpreted by the brain. Light passes through the transparent eye surface (the cornea). The pupil, the black opening in the front of the eye, is an opening to the eye interior. It can get larger or smaller to regulate the amount of light entering the eye. The colored portion, called the iris, is really a muscle that controls the pupil size. The inside of the eye is filled with a gel-like fluid. There is a flexible, transparent lens that focuses light so it hits on the back of the eye (the retina). The retina converts light energy into a nerve impulse that is carried to the brain and then interpreted. 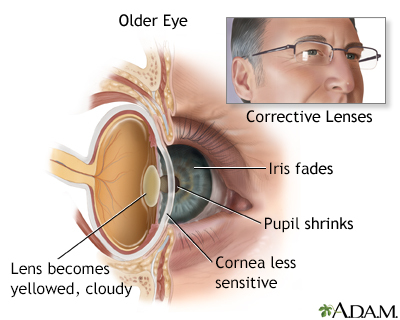 With age, the lens may become misshaped and the corneal tissue may become clouded.